DHAKA, Bangladesh (AP) — Bangladesh’s government agreed Monday to allow the country’s garment workers to form trade unions without prior permission from factory owners, the latest response to a building collapse that killed more than 1,100 people and focused global attention on the industry’s hazardous conditions. The Cabinet decision came a day after the government announced a plan to raise the minimum wage for garment workers, who are paid some of the lowest wages in the world to sew clothing bound for global retailers. Both moves are seen as a direct response to the April 24 collapse of an eight-story building housing five garment factories, the worst disaster in the history of the global garment industry. Though the 2006 law technically allowed trade unions — and they exist in many of Bangladesh’s other industries — owners of garment factories never allowed them, saying they would lead to a lack of discipline among workers. In recent years the government has cracked down on trade unions attempting to organize garment workers. In 2010 Hasina’s government launched an Industrial Police force to crush street protests by thousands of workers demanding better pay and working conditions. “Islam’s case is going nowhere even though police say they are investigating,” said Akter. 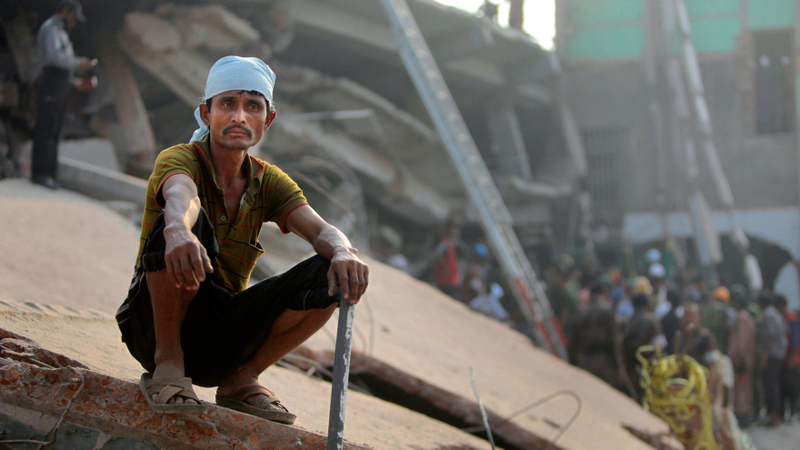 The collapse of Rana Plaza has raised alarm about conditions in Bangladesh’s powerful garment industry. Bangladesh is the third-biggest exporter of clothes in the world, after China and Italy. There are 5,000 factories in the country and 3.6 million garment workers. But working conditions in the $20 billion industry are grim, a result of government corruption, desperation for jobs, and industry indifference. Minimum wages for garment workers were last raised by 80 percent to 3,000 takas ($38) a month in 2010 following protests by workers. As of Monday, rescue workers said 1,127 bodies had been recovered from the ruins of the fallen building, where thousands were working at the time of the disaster. Teams were using hydraulic cranes, bulldozers, shovels and iron cutters to uncover bodies. “We are still removing the rubble very carefully as dead bodies are still coming up,” said Maj. Moazzem Hossain, a rescue team leader. Hossain said they are trying to identify badly decomposed bodies by their identity cards. On Friday, the search teams received a much-needed morale boost when they found a seamstress who survived under the rubble for 17 days on dried food and bottled and rain water. The Textiles Ministry has also begun a series of factory inspections and has ordered about 22 closed temporarily for violating safety and working standards.